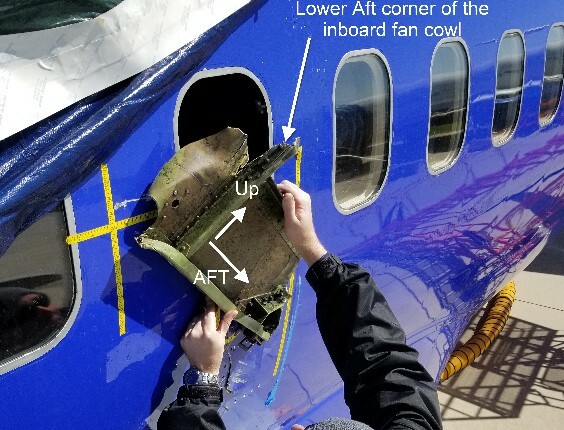 The US National Transportation Safety Board (NTSB) has issued a press release, in advance of a preliminary report, on a ‘fan blade off’ (FBO) occurrence to Boeing 737-700 N766SW operating Southwest Airlines Flight 3472, from New Orleans, Louisiana to Orlando, Florida on 27 August 2016. A second, seemingly very similar FBO event occurred to N772SW operating Flight 1380 from New York-La Guardia, NY to Dallas-Love Field, Texas on 17 April 2018. In that case debris penetrated a cabin window aft of the wing and one passenger is confirmed to have died (early reports suggest they had been partly sucked through the window). This was Southwest’s first passenger fatality ever and the first Part 121 passenger airline fatality since February 2009 (although all 7 crew died in a B747F crash at Bagram, Afghanistan in April 2013). One fan blade of the left hand CFM56-7B engine separated from the fan disc during the cruise. The root of that blade remained in the fan disc hub but the blade was not recovered. Consequently the entire left engine inlet separated from the engine, with debris damaged the fuselage, wing and empennage. A 5 x 16 inch hole was made in the fuselage just above the left wing and the cabin depressurised (though no engine debris penetrated the cabin). 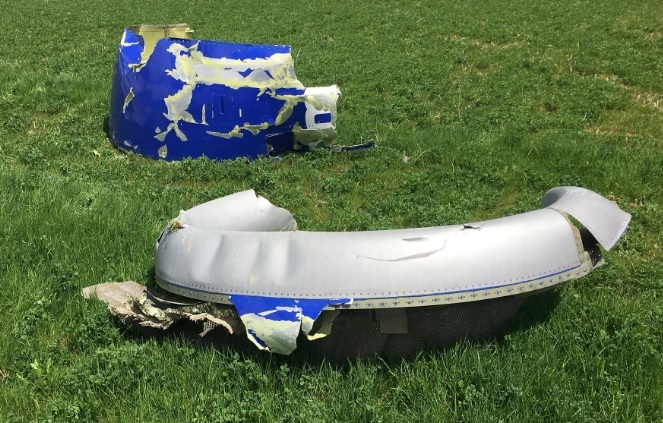 The NTSB call this an uncontained failure, though the fan blade does not appear to have exited radially (the true definition of uncontained) but instead axially (i.e. forward). The out of balance forces resulted in failure of the inlet structure. The CFM56 fan blades are manufactured of titanium alloy and are coated with a copper-nickel-indium alloy at the root contact face. The center of the fatigue origin area was about 2.1 inches aft of the forward face of the blade root. No surface or material anomalies were noted during an examination of the fatigue crack origin using scanning electron microscopy and energy-dispersive x-ray spectroscopy. The Flight Data Recorder (FDR) and the Cockpit Voice Recorder (CVR) have been down loaded by the NTSB. Parties to the investigation include the Federal Aviation Administration, Southwest Airlines, the Southwest Airlines Pilots Association, and CFM International. The French Bureau d’Enquêtes et d’Analyses pour la sécurité de l’aviation civile has appointed an accredited representative who is supported by a technical advisor from Safran Aircraft Engines. CFM International is a joint venture between GE Aviation [US] and Safran Aircraft Engines [France]. Future work will include 3-D measurements of the contact areas of all the blades, a non-destructive examination of the blade surfaces for cracks, and a review of the engine maintenance records. UPDATE 25 August 2017: The FAA issued a Notice of Proposed Rule Making for an AD for comment with 15,000 cycles since last shop visit as the applicability criteria. An occurrence was reported of fan blade failure on a CFM56-7B engine. 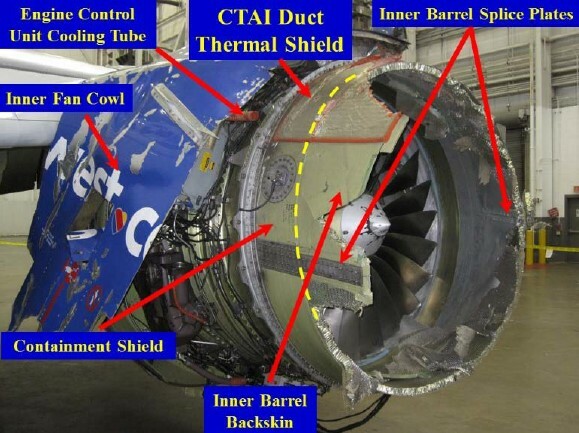 The released fan blade was initially contained by the engine case, but there was subsequent uncontained forward release of debris and separation of the inlet cowl. This is highly likely to be the Southwest case. Preliminary investigation determined that the fracture in the blade initiated from the fan blade dovetail. This condition, if not detected and corrected, could lead to fan blade failure, possibly resulting in uncontained forward release of debris, with consequent damage to the engine and the aeroplane. To address this potential unsafe condition, CFM International issued CFM56-7B SB No. 72-1019, later revised, and CFM56-7B SB No. 72-1024, providing inspection instructions. 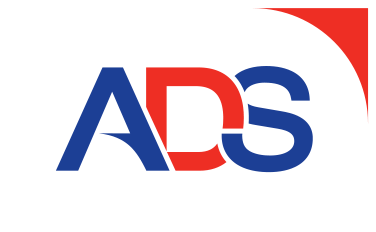 UPDATE 26 March 2018: EASA AD 2018-0071 is issued after a short consultation. The FAA NPRM has not resulted in an AD yet. Passengers…struggled to pull a woman back into the plane after she was sucked into a hole left by [the] shattered window, witnesses said. She hung out the hole for many minutes, said [passengers], who were in the seats behind the victim. The NTSB subsequently confirmed that the woman, seated in seat 14A, had died due to blunt force trauma to the head, neck, and torso, according to an official from the Philadelphia Department of Public Health. Seven others were treated for minor injuries. There were 5 crew and 143 passengers on board. 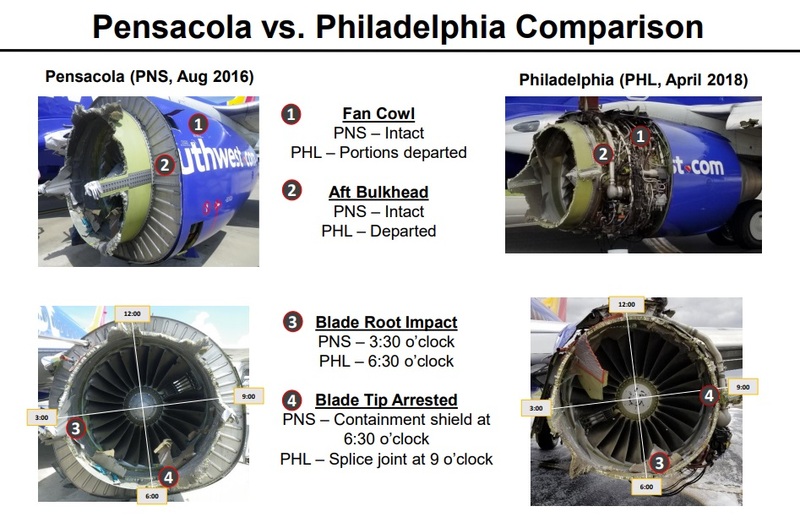 Engine nacelle damage was very similar to the earlier incident with a released fan blade but no penetration of the containment ring and loss of the nacelle intake. Additionally the outer fan cowl door separated and the inner door was badly damaged and open. 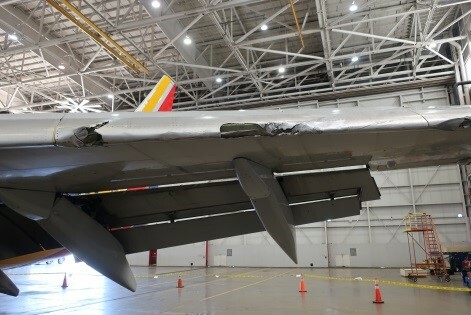 Leading edge damage was also evident on the left wing. The engine “had 40,000 cycles on it, a quarter of those since it was overhauled” said Southwest CEO Gary Kelley. This engine would therefore would have had 5,000 more cycles before being affected by the originally proposed (but stalled) FAA AD. The CFM56 family has achieved more than 350 million engine hours and powers around 6,700 aircraft worldwide. Southwest operate nearly 700 737-700/800s. UPDATE 18 April 2018: Video of on scene NTSB press conference 17 April 2018 by NTSB chairman Roger Sumwalt. The CVR and FDR have been returned to Washington and the CVR has already been downloaded. Cowling debris has been located at Bernville, Pennsylvania, about 60-70 miles west of Philadelphia. The crew elected to land with the flaps at 5 degrees (rather than 30 or 40) at a higher approach speed due to concerns of potential controllability issues. The NTSB have started that blade 13 (of 24) failed “at the hub” and there was evidence of fatigue. 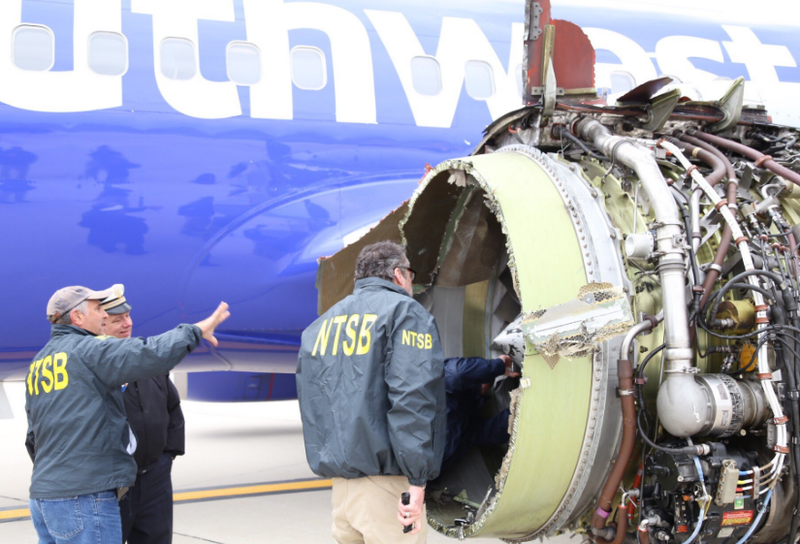 The NTSB say Southwest plan an accelerated ultrasonic inspection programme. Responding to an Aviation Week query, Southwest said it had inspected “more than half” of its 737-700/800 aircraft. Sumwalt praised the crew. The Captain is reported to be a former US Navy aviator. UPDATE 19 April 2018: The NTSB say blade broke in two places: “near where the blade meets the engine hub” and halfway along its length. An “internal crack likely caused the break near the hub, which then caused the mid-blade facture”. The NTSB say the FDR showed that as left hand engine ran down, vibration increased significantly and the cabin altitude alert sounded shortly afterwards indicating the cabin pressure had exceeded a pressure equal to 13,500-14,000ft altitude. The aircraft also made a rapid uncommanded roll to 41.3º left bank. No debris from the window was found on board. The NTSB released pictures of the nacelle debris. 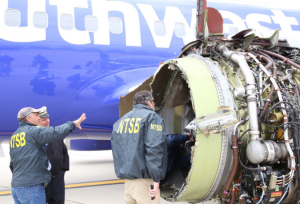 Southwest has said the engine on the plane involved in Tuesday’s incident would not have been subject to the parameters of the [original proposed] FAA directive [the 2016 NPRM]. The company has not said whether the engine was subjected to the ultrasonic inspection or given details of its maintenance history. A review of…maintenance on the Boeing 737 involved in Tuesday’s incident showed no prior engine problems. Southwest, based in Dallas, did not reply to questions Thursday night about why its officials did not believe it could meet the 12-month deadline [in the 2016 NPRM]. The FAA EAD only requires a one-time ultrasonic inspection (USI) of “all 24 fan blade dovetail concave and convex sides to detect cracking” on blades with over 30,000 flight cycles within 20 days (estimated as involving 681 engines globally). More comprehensively, the EASA EAD makes the compliance time for lower lifed blades, as described in the CFM56-7B Service Bulletin 72-1033, mandatory (in simple terms within 133 days if over 20,000 cycles now or within 133 days or at 20,000 cycles). EASA also requires inspections to then be repeated at intervals not exceeding 3,000 engine cycles. In a leaked memo Southwest have apparently ‘clarified’ their thinking in their response to the 2016 NPRM to their employees. Readers can draw their own conclusions by examining the original Southwest NPRM response. This expands on a rather simplistic video issued publicly. Southwest said it’s “significant to note” that the number of flight cancellations and delays is minimal, given Southwest’s 4,000 daily scheduled flights. The cancellations represent about 1 percent of its flight operations. 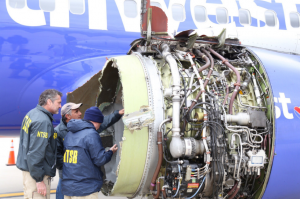 Southwest has declined to answer questions about its CFM56-7B inspection program, including how many engines were inspected before the accident, and if the engine that failed had been inspected and if the new inspections turned up any problems. UPDATE 26 April 2018: Southwest have inspected 25,500 of their 35,500 CFM56-7B blades. They have not yet found any more cracked blades but did identify one between the two occurrences. …garnered attention and concern from lawmakers, including Shuster [House Transportation and Infrastructure Committee Chairman Bill Shuster (R-Pa.)], who in his manager’s amendment included language that will require the FAA to conduct an engine safety review and present a report to the committee. UPDATE 1 May 2018: As President Trump meets the crew and passengers, the FAA match the EASA AD. The No.13 fan blade had separated at the root; the dovetail remained installed in the fan disk. Examination of the No. 13 fan blade dovetail exhibited features consistent with metal fatigue initiating at the convex side near the leading edge. Two pieces of fan blade No. 13 were recovered within the engine between the fan blades and the outlet guide vanes. One piece was part of the blade airfoil root that mated with the dovetail that remained in the fan disk; it was about 12 inches spanwise and full width and weighed about 6.825 pounds. The other piece, identified as another part of the airfoil, measured about 2 inches spanwise, appeared to be full width, was twisted, and weighed about 0.650 pound. All the remaining fan blades exhibited a combination of trailing edge airfoil hard body impact damage, trailing edge tears, and missing material. Some also exhibited airfoil leading edge tip curl or distortion. The No. 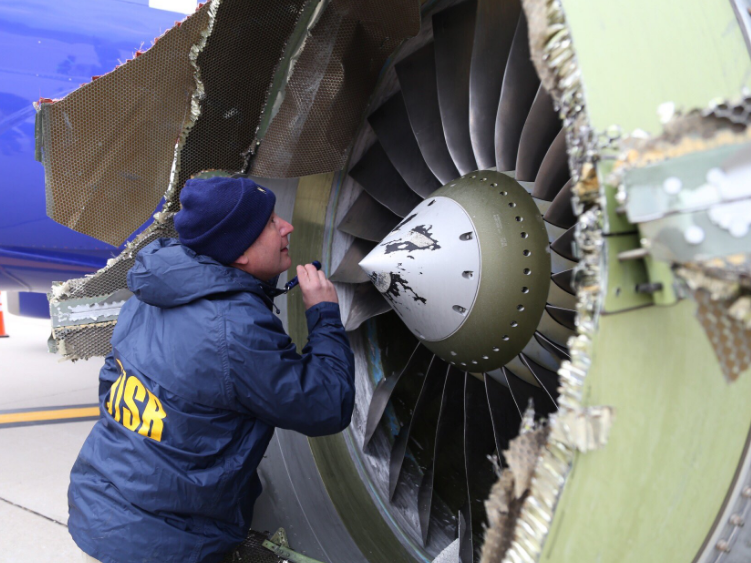 13 fan blade was examined further at the NTSB Materials Laboratory. Fatigue fracture features emanated from multiple origins at the convex side and were centered about 0.568 inch aft of the leading edge face of the dovetail and were located 0.610 inch outboard of the root end face. The origin area was located outboard of the dovetail contact face coating, and the visual condition of the coating appeared uniform with no evidence of spalls or disbonding. The accident engine fan blades had accumulated more than 32,000 engine cycles since new. 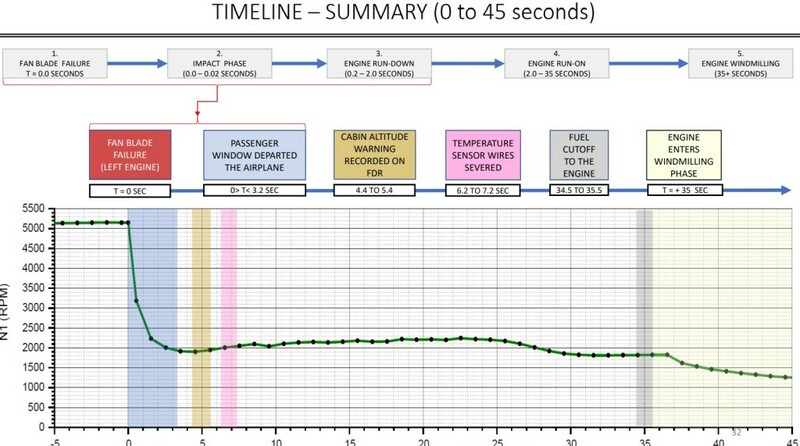 Maintenance records indicated the accident engine fan blades had been periodically lubricated as required per the Boeing 737-600/700/800/900 Aircraft Maintenance Manual. According to maintenance records, the fan blades from the accident engine were last overhauled 10,712 engine cycles before the accident. At the time of the last blade overhaul (November 2012), blades were inspected using visual and fluorescent penetrant inspections. After an August 27, 2016, accident in Pensacola, Florida, in which a fan blade fractured, eddy current inspections were incorporated into the overhaul process requirements. In the time since the fan blade overhaul, the accident engine fan blade dovetails had been lubricated 6 times. At the time each of these fan blade lubrications occurred, the the fan blade dovetail was visually inspected as required for the fan blades installed in the accident engine. The remainder of the accident airplane’s airframe exhibited significant impact damage to the leading edge of the left wing, left side of the fuselage, and left horizontal stabilizer. Three flight attendants were assigned to the flight, and an additional SWA employee was in a jumpseat in the cabin. During interviews, the flight attendants and the employee reported that they heard a loud sound and experienced vibration. The oxygen masks automatically deployed in the cabin. The flight attendants retrieved portable oxygen bottles and began moving through the cabin to calm passengers and assist them with their masks. As they moved toward the mid-cabin, they found the passenger in row 14 partially out of the window and attempted to pull her into the cabin. Two male passengers helped and were able to bring the passenger in. UPDATE 16 May 2018: Last week, Southwest completed inspections on more than 35,000 fan blades and the airline is now to track all engine fan blades by serial number. 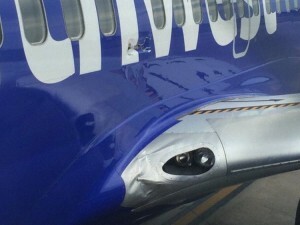 Southwest report they have rejected “20 to 30 blades” due to coating degradations. UPDATE 26 June 2018: The President of the Southwest Airlines Pilots’ Association said “he isn’t surprised” by the Inspector General’s decision to initiate an audit. He pointed at previous accusations of alleged malpractice within the Southwest maintenance organisation. CFM International CFM56-7 series engine fan blade design and development history. CFM International CFM56-7 series engine fan blade inspection methods and procedures. Engine fan blade containment design and certification criteria. UPDATE 1 October 2018: Regulators speed up inspections on engines tied to fatal Southwest accident (EASA AD 2018-0211 which supersedes EASA AD 2018-0109 dated 17 May 2018). History of the Flight: On June 3, 2017, at 0820 eastern daylight time, a Boeing 737-7H4 airplane, registration number N765SW, powered by two CFMI CFM56-7B24 turbofan engines, operated by Southwest Airlines (SWA) as flight number 4635, experienced a right-hand (No. 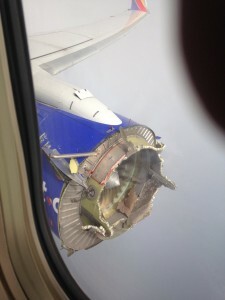 2) engine failure while enroute from Tampa Florida to Rochester New York. The airplane was diverted to Washington Dulles International Airport (IAD) where an uneventful single engine landing was performed, and no injuries were reported to any of the occupants. Damage Found: The right-hand engine inboard fan cowl exhibited an 8.75-inch circumferential (long) by 3.75-inch axial (wide) impact rip/tear/slice at about the 9:00 o’clock position. When the fan cowls were opened, loose debris was collected; a piece of gear teeth rim had a part number marked on it that corresponded with the accessory gearbox 47-tooth gearshaft assembly, also known as the control alternator gearshaft, line 3 (L3) gearshaft, or L3 gear train. Probable Cause: The failure the control alternator gearshaft, which disconnected the accessory gearbox from the rest of the engine and resulted in an uncommanded in-flight shutdown of the left engine and subsequent flight diversion. The control alternator gearshaft failed because of high cycle fatigue intergranular corrosion cracking. Contributing to the failure of the control alternator gearshaft were additional manufacturing processing steps to address part non-conformances that reduced its high cycle fatigue capability and potential change in vibratory environment since the last shop visit. Corrective Action: Of the eight L3 gearshafts from the same production batch as the failed SWA gearshaft, two are no longer in service, and the remaining six have all been positively identified as installed in an AGB on an in-service engine. CFMI, as a preventative action, releases service bulletin CFM56-7B 72-1032-R00 on March 12, 2018 that recommends removal of the seven remaining L3 gearshafts (including one that is currently out-of-service) from the same production batch as the failed SWA L3 gearshaft at the next AGB overhaul. Currently, Safran Transmission Systems limits the number of additional manufacturing operations to address non-conformances during production; for example, the number of acid etchings has been limited for the steel gears/gearshaft. This process has been in use for several years; however, considering this event, the process is being reviewed for improvements in process documentation. This is discussed in detail in the NTSB Powerplant Group Factual Report. UPDATE 6 November 2018: The NTSB announce they will hold a public hearing on 14 November 2018. ….the one-day hearing will focus on CFM International CFM56-7 series engine fan blade design and development history, CFM International CFM56-7 series engine fan blade inspection methods and procedures, and engine fan blade containment design and certification criteria. A failure timeline is now also online. It was also noted that the CFM56-7B failed its first certification FBO test in the mid-1990s but ultimately passed a second test after containment changes.